If you spot Darth Vader and other Star Wars characters outside Moscone Center this morning, they're going to be too busy protesting Google to pose for pictures. At 10 a.m. today, a coalition of labor, housing, and community activists say that they'll be reminding the tech giant that it's not living up to its "Don't Be Evil" corporate credo at Google's I/O Developer's Conference, which begins today at San Francisco's Moscone Center. The protest comes the morning after a separate group of protesters, going by the name Occupy Google, staged a demonstration at Google's Mountain View headquarters that led to ten arrests, according to Valleywag and the group's Twitter account. Today's protest is led by the Service Employees International Union, United Service Workers West (SEIU-USWW), which says that they are calling on Google to work with its security workers on a new contract. Alfredo Fletes, one of the protest organizers and a representative for SEIU-USWW, says that Google is "messing with security officers' lives" by giving them part-time hours without benefits and that with limited hours in multiple locations—making workers trek from Mountain View to San Francisco—their $17 an hour pay isn't cutting it. “The workers are just fed up with scraping by and they’re coming together to demand a security contract that will support worker’s rights to collectively bargain,” Fletes says. “We’re asking them to step up and support good jobs.” Fletes says that Google’s track record of illegal surveillance is also an issue for its security workers. Fletes adds that Google's representatives have not said whether or not they support a union and the workers, who are employed by Security Industry Specialists, have not yet filed for recognition with the company. According to a statement sent this morning, Supervisor John Avalos, Tim Paulson of the San Francisco Labor Council, and members of Eviction Free San Francisco, Jobs with Justice, San Francisco Rising, and Senior and Disability Action will also be participating in the demonstration. "Thousands of Googlers call the Bay Area home, and we want to be good neighbors. Since 2011 we've given more than $70 million to local projects and employees have volunteered thousands of hours in the community. We’re excited to be expanding that work in 2014 with the recent Bay Area Impact Challenge winners--several of them have even joined us at I/O! As for the protesters, may the force be with them." 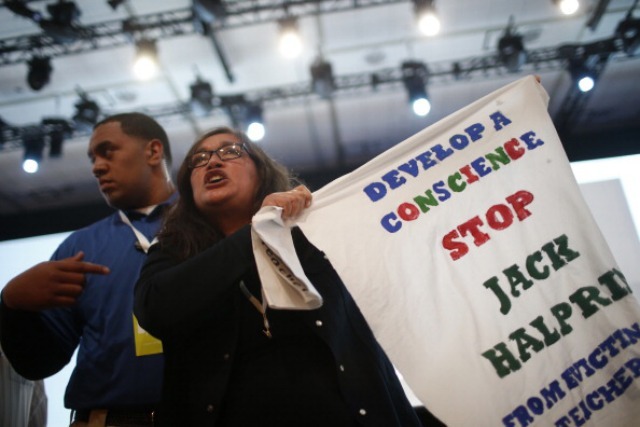 One might wonder if Google's jokey mood soured when, as reported by The Huffington Post, one protestor hopped on stage to interrupt a presentation on new features fro Android to hold up a banner reading "DEVELOP A CONSCIENCE: STOP JACK HALPRIN FROM EVICTING SF TEACHERS," a reference to a Google staffer who is presently seeking to evict tenants from a building he recently purchased at 812 Guerrero. According to Mission Local, which is liveblogging the action, the protester was Claudia Tirado, one of the tenants Halprin is attempting to evict. In an interesting turn, Tirado told Mission Local that after she was pulled from the stage, Rachel Whetstone, Google’s senior VP of communications, told Tirado "that she’d talk to Halprin directly about the issues at 812 Guerrero." Though today's action is unrelated to last night’s Occupy Google action, at which a group held a banner that read "Protect Net Neutrality," those activists tweeted support for this morning's I/O Conference demonstration. Below, check out video from the Occupy Google protest.